The hotel has 4 stars and is located in immediate proximity to the central train station, in the historic district of Antwerp. Hotel offers accommodation in 173 rooms, including 4 suites and family rooms. The hotel has the restaurant Arivé, which creates the atmosphere of comfort and home. There you can enjoy national dishes of the traditional Belgian and international cuisine. For events, the hotel offers a choice of 13 meeting rooms with a capacity for 643 people, executed in a cozy style and equipped with modern appliances and all the amenities. In addition, you can enjoy views of the city skyline from the upper floors of the hotel. The spa area with sauna and fitness center will help to relax and unwind. Also, the hotel ensures free Internet access and low prices for its visitors. For guests, traveling by car, parking is provided. 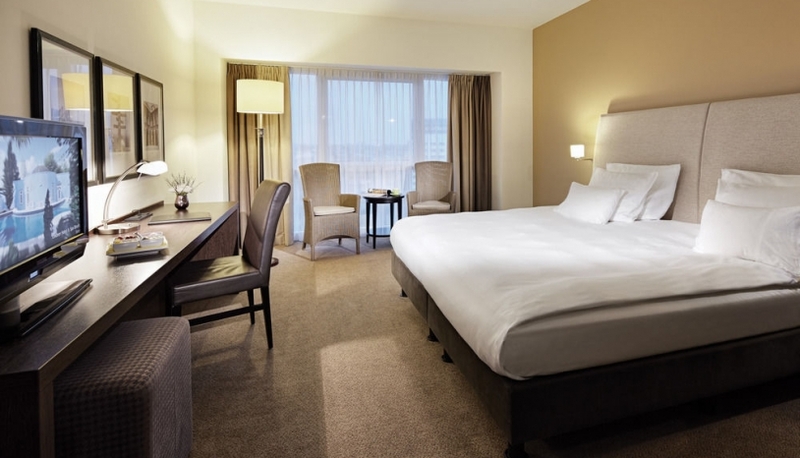 The magnificent 4-star hotel is situated in the historic Antwerp Centre. It offers accommodation in 127 comfortable rooms with free wireless internet and cable TV. The hotel has 3 meeting rooms for negotiations and meetings, dry cleaning, as well as the Caroussel restaurant, which serves modern world cuisine dishes. There is also a cozy decorated bar Tartuffe, where you can enjoy a drink and socialize after a long day. For drivers there is paid parking on the territory of the hotel. The visitors with pets can safely stay here, they are allowed. Also, the hotel offers their guests a sauna for rest and relaxation. 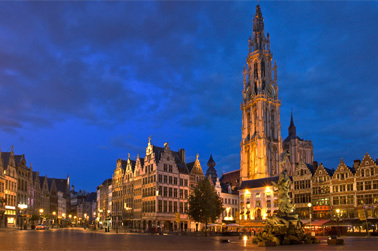 The hotel is located in the historic city center, in a quiet street, next to the Grote Markt. Major museums, churches, shopping streets (e.g. de Meir and Groenplaats) are within walking distance. The hotel has 36 rooms for guests accommodation. There are standard rooms, which are located in front part of the hotel, as well as deluxe rooms, which windows look out on the interior garden. Some rooms have a terrace. The whole hotel has wireless Internet access. Guests are served a complimentary breakfast in the form of a "smorgasbord", with a wide selection of hot and cold dishes. In fine weather, guests have the opportunity to have breakfast on the terrace. For guests with a car, there is a covered paid parking on the hotel’s territory. It is the largest 4-star hotel in the city. It is situated not far from the Skyscraper Burentoren and the Cathedral of the Virgin Mary. It offers for placing 210 rooms of the following types: suites, rooms for people with disabilities and family rooms. The accommodation with pets is allowed. The hotel has a restaurant , which overlooks right on the central square. The hotel offers a wide range of services, such as a fitness center, bike and car rental and an express check-in, as well as sightseeing tours. For business events and meetings there is conference room. Guests can enjoy stunning views from the terrace, located on the roof. The visitors will have to pay for the internet access. The hotel has 8 floors with 127 beautifully appointed guest rooms, which include suites and family rooms. The Diamond District, shops, restaurants, bars, nightclubs and many popular attractions are situated in a 5-minute walk from the hotel. For visitors free Wi-Fi is available in all rooms and public areas. There is also a gym to keep fit. The hotel has a secured parking lot. The hotel is environmentally friendly, it has the Green Key Certificate. Pets are not allowed, except the guide dogs. GFE4.ME © 2019. Tous droits réservés.